With four-wheel drive, a total of 210 kW or 286 horsepower, and the innovative option of wheel-selective electronic control of the drive torque, Schaeffler's ACTIVeDRIVE was one of the all-electric (so-called battery-electric) vehicles that came face to face with the public and the competition at the 1st Bodensee Elektrik rally. 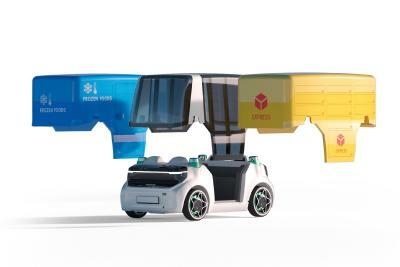 The concept vehicle from the leading technology company was also one of the most powerful vehicles among the teams made up of notable participants. "The ACTIVeDRIVE is a test system, demonstrator for various technologies, and a laboratory on wheels", explains Prof. Peter Gutzmer, CTO at Schaeffler, who drove the ACTIVeDRIVE with project manager Christian Weyhersmüller on all 5 stages and 400 kilometers of the first rally for electric vehicles around Lake Constance. 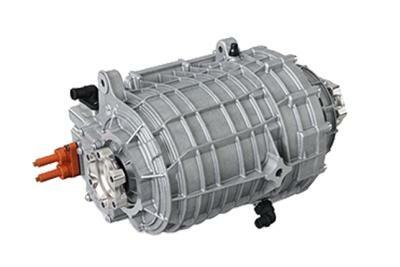 The special feature of the Schaeffler ACTIVeDRIVE is the active electric differential mounted both on the front and rear axles (Schaeffler eDifferential). This component combines an electric drive with the option of controlling the drive power in each wheel individually. This facilitates torque vectoring (distribution of torque between the right and left wheels), which is beneficial for driving dynamics, safety and comfort. "The eDifferential permits intervention in driving dynamics through selective power supply instead of through braking intervention and thus power reduction as is the case with ESP. The active electric differential significantly improves the transmission of force when driving on surfaces with varying frictional values. It also supports the steering system and has a positive effect on the driving dynamics, safety and driving comfort. In addition, using two eDifferentials enables the longitudinal distribution of drive torques", says Prof. Gutzmer. Actively distributing the drive torque makes the eDifferential an ideal platform for innovative driving dynamics control. The solution demonstrated in the ACTIVEeDRIVE makes Schaeffler a pioneer of such electric concepts in one vehicle drive. The eDifferential integrates two water-cooled permanent magnet synchronous motors (PMSM) of different dimensions, a planetary gear, a transmission for active torque distribution and, as a key element, a Schaeffler lightweight differential. The electric drives are manufactured by Schaeffler brand IDAM. 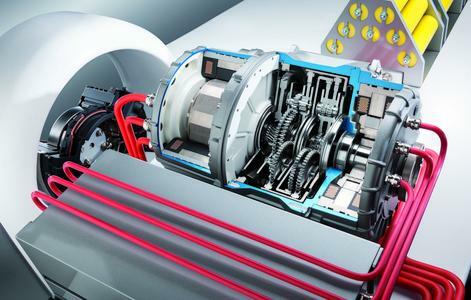 The larger up to 105 kW and 170 Nm PMSM provides the drive. The second PMSM, which regulates the distribution of torque, must only supply 5 kW of power in order to generate a difference in torque on the axle of up to 2000 Nm. The other innovations incorporated in the ACTIVeDRIVE are an integrated electromechanical parking lock, a new force-feed lubrication system without an oil pump for the transmission, planet carriers of sheet metal and various high-speed bearing solutions with optimized friction characteristics. The electronic control system is manufactured by AFT and is therefore also a Schaeffler product. 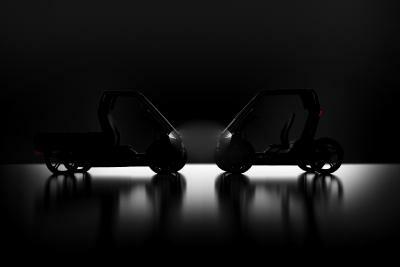 Due to the use of two active electric differentials, the concept vehicle has an overall output of up to 210 kW and features four-wheel drive. Li-ion batteries located in the propshaft tunnel and in front of the rear axle with a capacity of 18 kWh function as energy stores. Thanks to its performance and traction capacity, the test platform, which weighs 1,900 kilograms, accelerates from 0 to 100 km/h in 8.5 seconds. The vehicle features electronic top speed regulation at 150 km/h. This innovative Schaeffler drive system is thus highly suitable for modern hybrid vehicles in which such a drive solution on the rear axle supplements the internal combustion drive train that drives the front wheels. This increases the performance capacity of these hybrid vehicles, since this system incorporates an efficient and manually selectable four-wheel drive solution in addition to moving off using electric power only and activating the electric motor (so-called boosting). Since this means the propshaft traditionally required in four-wheel drive vehicles is no longer necessary, developers in the automobile industry occasionally refer to this "electric axle" as an "electric propshaft". The idea for this innovative drive system came into being during the development phase of Schaeffler's lightweight differential with face spline. In the early stages of development, this lightweight and compact differential was arranged coaxially to an electric motor, which produced an extremely compact electric drive. 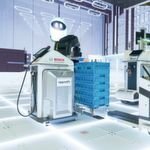 Potential for optimizing driving dynamics, comfort and safety is generated when the system is combined with a superimposing transmission and a second, significantly smaller actuator. The eDifferential is already a winner - be it as a drive in a modern and dynamic hybrid vehicle or in Schaeffler's ACTIVeDRIVE concept vehicle based on a Skoda Octavia Scout. The Gutzmer Weyhersmüller team won a special stage of the 1st Bodensee Elektrik rally and we can certainly expect further success stories from this groundbreaking drive technology in the future. Schaeffler with its product brands INA, LuK and FAG is a leading provider of rolling bearing and plain bearing solutions and of linear and direct drive technology, as well as a renowned supplier to the automotive industry of high-precision products and systems for engines, transmissions, and chassis applications. The globally active group of companies generated sales of approximately 10.7 billion euros in 2011. With approximately 74,000 employees worldwide, Schaeffler is one of the largest German and European industrial companies in family ownership. With 180 locations in over 50 countries, Schaeffler has a worldwide network of manufacturing locations, research and development facilities, sales companies, engineering offices, and training centers.